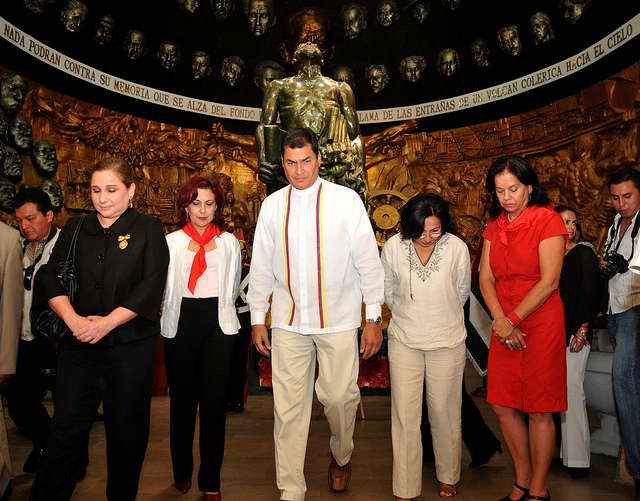 On the occasion of the Centenary of the events of January 28th, 1912, appropriate ceremonies commemorated the great contributions of Eloy Alfaro, presided over by his great grand-nephew, Ecuadorian President Rafael Correa Delgado. 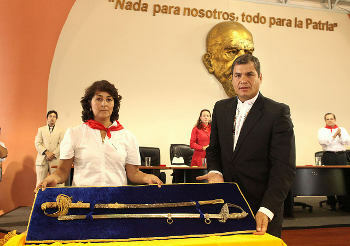 At this ceremony, swords of Eloy Alfaro and Pedro Montero were symbolically presented – with the president representing the citizenry. All present wore a red scarf as a symbol of the “Barbaric Bonfire”. Irene Marquez de la Plata, great-granddaughter of General Alfaro, further explained that these scarfs represented “…a bonfire that should not be repeated but left lit in the path of the progress of the country, the modernization and institutionalization of the state.” During the event, Mireya Cardenas, Secretary of the People, delivered to the president a document intended to serve as a basis for land reform to benefit the peasant villages. 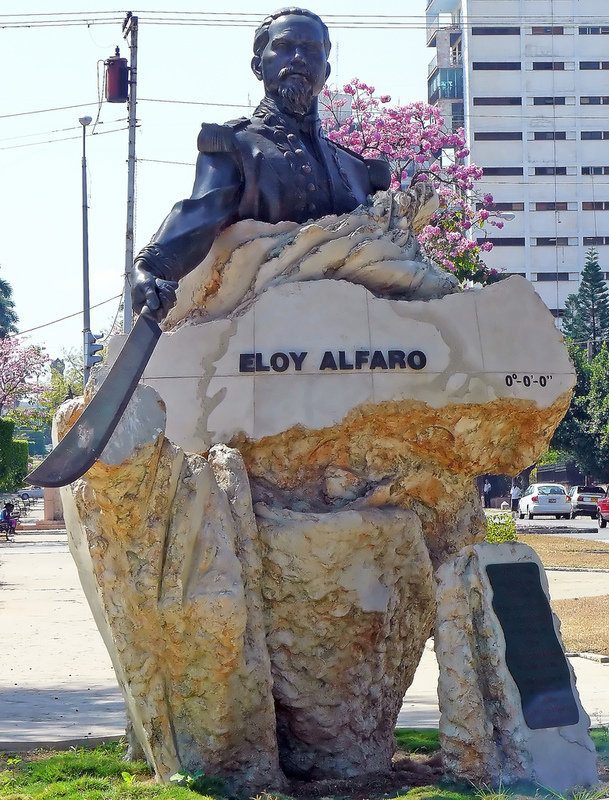 Close to the birthplace of Alfaro in Manabi Ecuador, a district has been set aside named “Alfaro City” (Ciudad Alfaro). The site includes a Mauseleum, a symbolic railroad car called the “Train of National Unity”, an Historical Museum and a large Multi-Purpose Auditorium. On August 8, 2009, a large bust of Eloy Alfaro was unveiled at the Organization of American States in Washington D.C. at a large ceremony by the OAS Secretary General, José Miguel Insulza. The statue is located on the South Lawn of the OAS property. Click here for a photo gallery of the event. When Alfaro assumed power in 1895, Cuba was still a Colony of Spain. Alfaro took the unusual step of writing a letter to the Queen Regent of Spain calling upon her to give Cuba the independence that the population was demanding. The letter arrived at a critical time when a revolutionary war was underway in Cuba and the outcome was uncertain. A few years later, after the destruction of the USS Maine, the U.S. would become involved in Cuba’s efforts for independence (1898) but in the decades that followed, U.S. involvement in Cuba’s affairs was often not helpful. But Cubans never forgot Eloy Alfaro’s assistance in their moment of dire need and he is favorably remembered to this day. This entry was posted in Church and State, Historical Survey, Presidents. Bookmark the permalink. U. Texas : Ecuador Info Cntr.